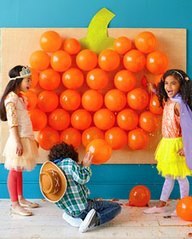 Create a cutout from green paper that looks like the top of a pumpkin and attach high on a wall. Blow up orange balloons and attach with masking tape of push pins. Use this as a display for the party or on the outside of your home for trick or treat night. Older kids, with supervision, could use a push pin to pop balloons in turn until they are all popped. Could be done for different parties making a strawberry, heart, Christmas tree, wreath etc. This entry was posted in Crafts ~ DIY ~ Projects, ~Halloween, ~Party Items and tagged balloons, game, kid, kids, orange, pop, popping, pumpkin, ~Party. Bookmark the permalink.